I was inspired to create this painting by my love for Northern MN. The last time I saw the northern lights was in the winter of 1998. They were so fabulous that winter, there were no words to describe them. My husband and I would stand outside our rural home and stare in awe watching the lights streak and stretch across the sky starting from the horizon line and extending over our heads. 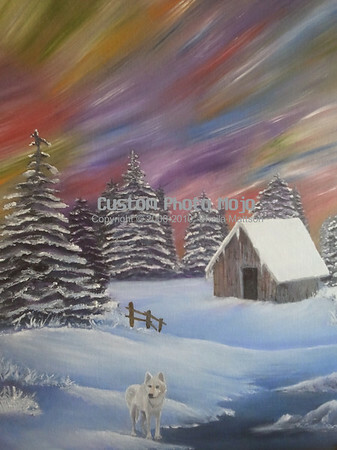 The painting started with only northern lights but I felt like it was missing something... Something important that would add to the painting but not interfere with the peace and serenity of the scene. It took only a second to realize the missing element was a lone wolf. I didn't have a picture of any wolves so I logged onto the International Wolf Center's website and watched the wolves via their webcams. The wolf in my painting was one of the older "retired" wolves. It was quite a treat to watch this wolf.